Last week, I had one of those days. One of those diabetes days, to be more precise. I was stuck in the 300s all afternoon for no apparent reason. Multiple correction boluses and a set change, and that blood sugar WOULD. NOT. BUDGE. Making things even more frustrating, I was headed to dinner that evening at my parents' house. I was frustrated beyond words, shedding a few tears in the car on the way over. Thankfully, the yummy dinner my mom had prepared happened to be quite low carb, so at least I still got to eat. My frustration was fairly obvious, so of course my family noticed. My mom, dad, and brother all gave me a hug and did their best to encourage me. Like they always do. I'm so blessed to have such an understanding and supportive family. My aunt was at dinner too. She's like my second mom, and has been there since my diagnosis. She's also been a nurse as long as I can remember. A cardiac intensive care nurse, to be more specific. I know she worries about me and my diabetes, because of what's she's seen at work. She's seen people with some of the worst complications I can imagine. So you can see why she worries. We were discussing the stubborn high, and I was telling her that I try not to get upset about it. But sometimes I can't help it. She looked at me and said, "Well, I think you're remarkable." Tears instantly sprung to my eyes. Coming from her, that meant more than I can even describe. I hugged her, and tried not to cry. The more I've thought about it, the more I've realized that she's right. 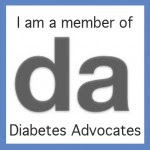 Living a life in spite of diabetes or any other chronic health condition is pretty remarkable. WE are remarkable. If you live with or love someone with diabetes or any other condition, YOU are remarkable. You really are! Just getting out of bed in the morning and making it through the day is a big deal, especially with an attention demanding disease like diabetes. But we do it, day after day. Some days are better than others, but we do what we can to take care of ourselves. That is remarkable. Yes! This. A remarkable post! Her words made me tear up too. You ARE remarkable. I love your aunt.